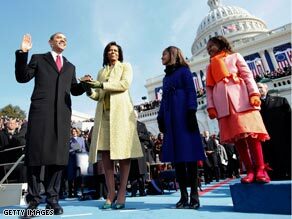 President Obama and his wife, Michelle, and their daughters, Malia and Sasha, greet the nation. Michelle Obama's urban chic heads to D.C.
iReport.com: What does Obama's presidency mean to you? "The last time we had an image of a black family that was this positive it was "The Cosby Show," but this is the Real McCoy," says Jacqueline Moore Bowles, national president of Jack and Jill of America Inc., a predominantly black organization for youths. The Obamas' two daughters, Malia and Sasha, also offer America a new way to look at black kids, others say. Throughout Inauguration Day, the two girls stood before the cameras and waved, smiled and played to the cameras.